I am the only girl in a houseful of boys. Sometimes, though, I like to be by myself--to read, to write, or just to be. I don't have a whole room to myself, but I do have my own little corner of the world. . . in the corner of the kitchen. Like Cinderella? No, not Cinderella. Just Richella. Books, photos, flowers, my blog logo. My mom's jewelry box, now a caddy for desktop supplies. And my favorite thing: my reading chair. This chair is where I sat and nursed my babies. 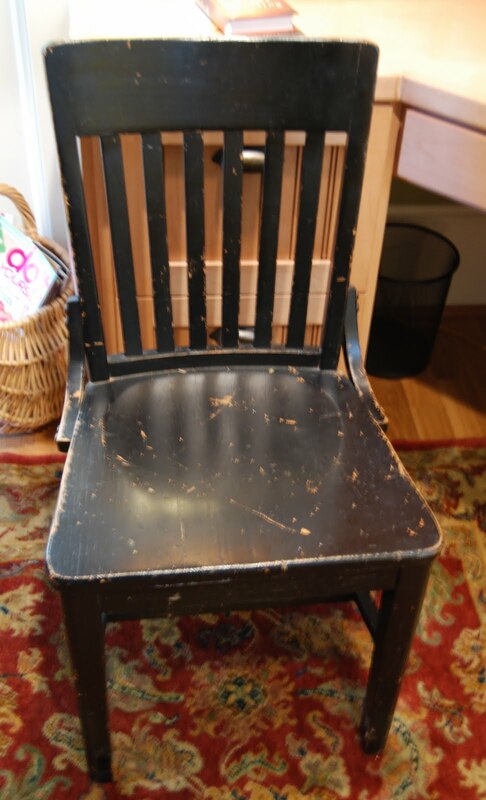 Hundreds of hours I spent in this chair, a tiny redheaded boy in one hand and a book in the other. It's been re-upholstered since then, but its contours still fit just right. Oh, the memories. It's just a tiny corner of the world, but it's all mine! I love your Mom Cave. You have your own little corner, yet you are close if anyone needs you. Using your mom's jewelry box for office supplies is a clever idea. I need to show that to my mom. She has a similar box that she could use. have you been hiding this little corner of you? i love it. your "R"... your blog logo... Jesus... and your mom's box. that just threw me over the top. you know i love your heart... and the things that make your heart smile make mine smile, too. I remember seeing this area the very first time I read your blog, but I didn't realise it was at the far end of the kitchen. It's such a sweet space, and totally you. I would know who's space it was as soon as I saw it! Grace, class and beauty. You have it going on! I need to rethink my whole concept and dream much bigger! good Luck with the contest. I just love the term 'Mum cave'! Everyone should have one as gorgeous as this! I love the way it's still part of the family space but also just for you. If Cinderella had that corner, I don't think she would have minded so much! I've said it before, but I love your house! Do you mind if I'm just a teeny bit jealous? Love it Richella! Never heard the phrase before, but I love it! Your reading nook is so pretty. Great pix. Love that you have your own space! You have inspired me to create my own space like that. I have a desk area in my kitchen but it needs organization! Thanks for showing us. Cinderchella, that is the prettiest Mom Cave around. I think your whole house is sensational and that area feels so homey and inviting. I also like that it's in the middle of everything, even though it's still cozy and private. You aren't secluded in some dark room all by yourself. Love it! Love the neatness, the personality, the functionality. My space always ends up such a mess and I long for the order you have! Blessings!!! I love your little corner! And I LOVE the idea to frame your blog logo! I love your mom cave, too. What a great space tucked away in the corner of your kitchen...the room you probably spend the most time in! I love your mom cave. It's so U! I love it! Your cabinets are beautiful and I love the idea of using your mom's jewelry box to hold your craft supplies. It just made me happy to see your space. Do you read these comments, Richella? Well, as the lone man reader this week, or at least the lone man commenter, it is very enjoyable to see your little corner of the world, although I'm sure you have your other "spots" around. When you highlighted your kitchen I noticed you had your computer on the bar which is probably one of those other places. We have a leather couch and recliner where I have spent probably 100's of hours reading with my son Christopher and to a lesser degree with Catherine and with the whole family, but it seems like most of my own reading was done in bed, in the office or at school. I will try to put a man cave on my blog soon! I just love our mom cave! I love your creative use of your mom's jewelry box too! I want a "richella-corner", too...I love how the winged chair is out into the room, rather than in a corner...how do you hide your electrical cord? Your kitchen table is beautiful...and HUGE! I love the logo, framed-- I have the word GRACE framed and in my desk area, too. Maybe you knew that? Anyway, I remember giving our black leather rocker recliner to a girlfriend for her husband's office a few years back. It held the same memories yours does. in fact, my water broke in that chair! LOL! Thank you for sharing such a meaningful part of your home with me! The jewelry box caddy? Brilliant! And I love your plates and prints in the guest room. 68 cents! Amazing.